The Prestashop module allows the store admin to browse their site as any of the registered customers. This helps them detect the problems that the customers might be facing during their online transaction. Listed below are some of the features offered to the e-merchants by the module. Prestashop login as customer addon allows the admin to browse the website as a customer without even knowing the password. The store owner can get an access to the account of any of the customers except for the guest visitors. 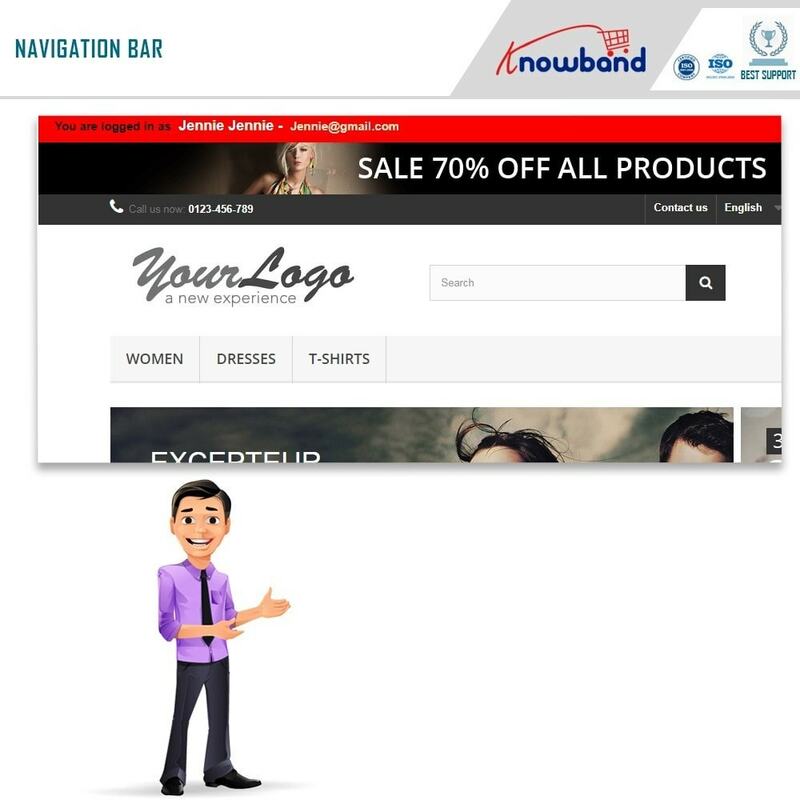 The store owner can enable the functionality to display the search bar at the top of the admin interface. All the Prestashop store admin needs to do is to search the email id of the customers. On clicking the id, the admin will be redirected to the front end of the website logged in as that particular customer. Prestashop Login as Client module allows the admin to track the orders and the cart of the user from the front-end. By getting an access to the user’s account, the store owner can improve the customer relations. The support team can assist the customer in the process of placing their order. Whether the store visitor is not able to add a product to the cart or he’s unable to use a coupon code, the team can help them throughout the transaction just by logging into the account of the customer. Just by taking the remote access to their account, the admin can resolve their problem in an efficient way. 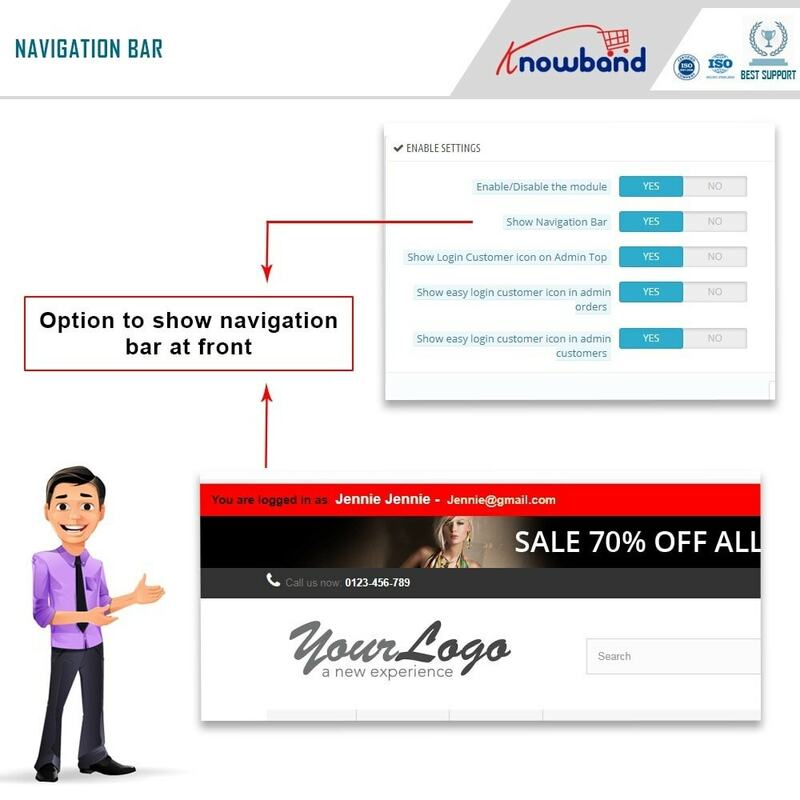 By browsing the site as an end-user, the admin can test the functioning of the website effectively and optimize its features from the user’s perspective. The functionality can be enabled or disabled just by toggling the button in the back end of the admin interface. 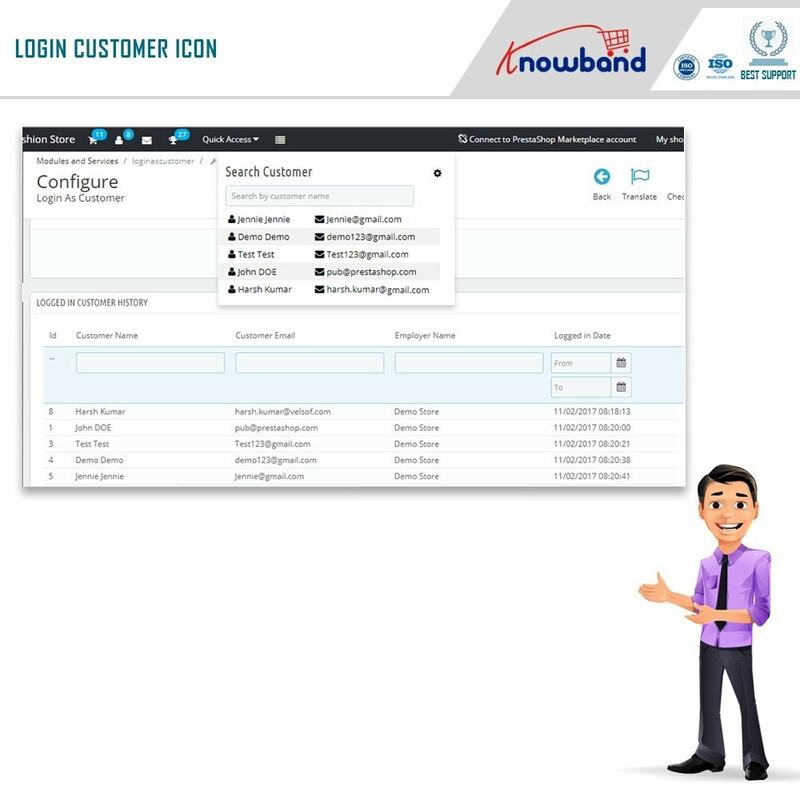 The store admin can select the login detail of the customer from the order detail list of the store using this Login as Customeraddon. Not just this, the admin can even select the credentials by browsing the entire list of the registered customers available at the store using this Prestashopextension. 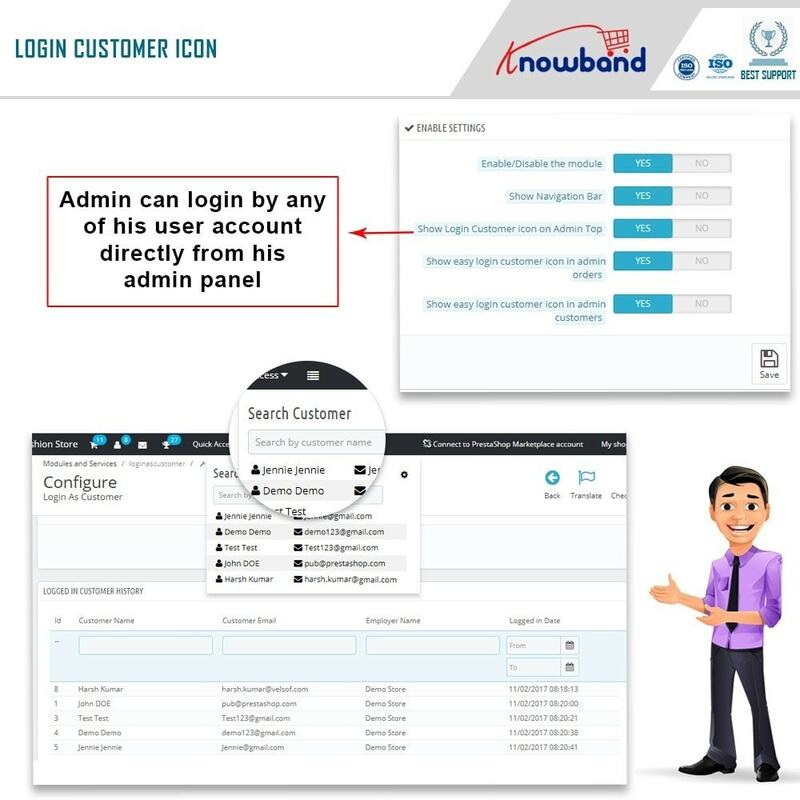 The quick login option enables the admin to search the name of the customer in the search bar. The Prestashop store admin can view the details of the customers that were used for logging into the website. 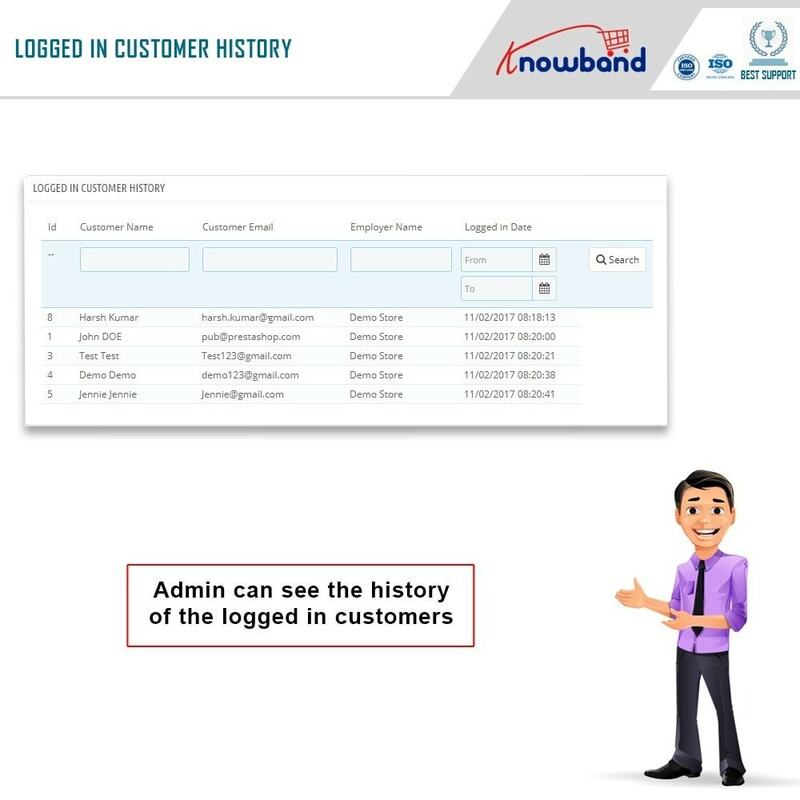 The name of the customers with which the admin has logged in is flashed on the front-end of the website. Prestashop quick login as customer module is compatible with the latest version of Prestashop and supports all its themes. The Prestashop Login As Customer without Password module doesn’t conflict with other extensions of the store.